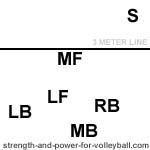 Volleyball serve receive tips for passing in 3 player formations. The 3 player serve receive is preferred by teams that play higher level volleyball. Passing responsibilities are more straightforward because only 3 players need to communicate when passing. With only three passers lined up to pass, this gives attackers more freedom to line up in different areas which then allows for a more creative offense. 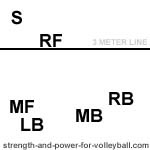 The three person serve receive formation is basically a line of three players formed by the three primary passers. 1. With fewer passers there is less gray area between passers and you'll likely have less communication problems. 2. Just have the best 3 passers pass. You can hide the setter and two other weak passers. 1. Each player has more court space to cover. 2. When just three players are passing, often the setter must start far from the net (in order to avoid the overlap). This is especially true when the same 3 players pass in all six rotations. The following are examples of serve reception patterns for the three player serve receive when running a 5-1 offense. 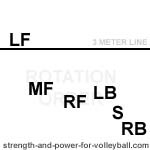 Do you understand volleyball alignment? 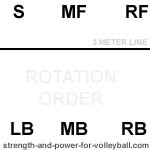 This is the rotation order for the 5-1 setter in position 5. This the serve receive alignment for the setter in position 5. 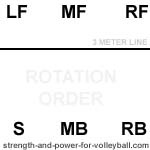 This is the rotation order for the 5-1 setter in position 4. 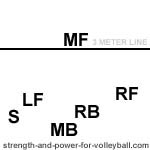 This the serve receive alignment for the setter in position 4. 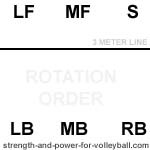 This is the rotation order for the 5-1 setter in position 3. 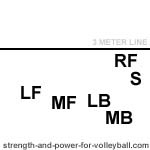 This the serve receive alignment for the setter in position 3. 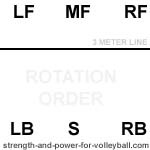 This is the rotation order for the 5-1 setter in position 2. This the serve receive alignment for the setter in position 2. 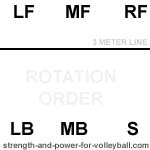 This is the rotation order for the 5-1 setter in position 1. 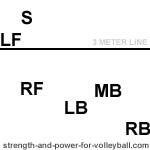 This the serve receive alignment for the setter in position 1. 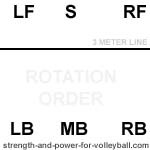 This is the rotation order for the 5-1 setter in position 6. This the serve receive alignment for the setter in position 6.